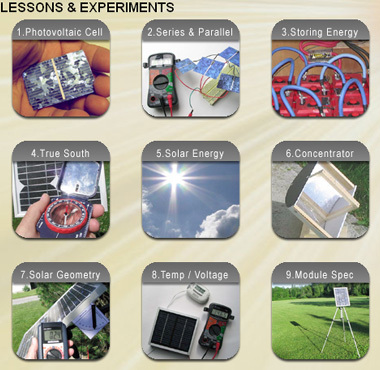 Online lessons with experiments are available for teaching renewable energy in schools. Solar101 content is suitable for middle school. Each lesson is accompanied by a simple experiment that students can perform to consolidate their understanding. Short videos explain concepts in a movie format that engages younger students. WebLab™ is intended for senior grades. 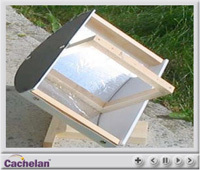 It includes experiments that require the students to use SolarVu® to study the performance of the solar PV system at their school to learn about real world performance. Lessons can be viewed online or download as a PDF and printed for classroom use where a computer is not available. WebLab™ includes an instructor guide with illustrations for teachers that wish to create their own lesson plans. 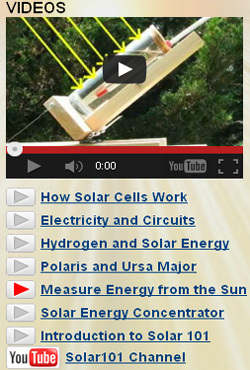 An excellent resource for a science fair project is the school's own solar PV system. 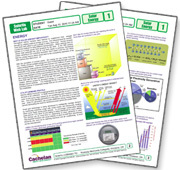 Students can use SolarVu® to study system performance then print graphs with analysis and explanation. Photos and images can be uploaded into the slideshow using WebFilm® for sharing and exhibiting presentations online.